Wine geeks are sometimes told to lighten-up. Wine is “just a drink”, “just a grocery”. When it comes to serving whites at 42° F versus 47° F, matching wines to specific glasses and pairing Assyrtiko rather than Sauvignon Blanc with crudo, I agree. A winery in Georgia’s Kakheti region. However, I suggest you don’t tell a Georgian to chill about wine. 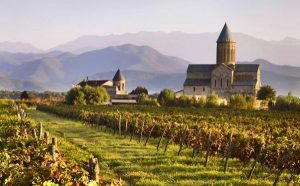 In this dramatically rugged Caucasus Mountains country, wine is holy. And not just the communion wine. While all wine is revered, those made in qvevri (pronounced kwev-ri) are the most precious. Qvevri (left) are fired clay vessels lined with beeswax that look like super-sized amphora. 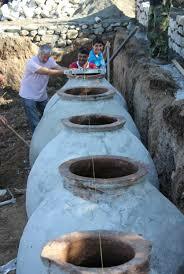 They are easily 1,000 liters large and are buried in the earth for fermenting and aging wine. One of the reasons qvevri wines resonate so strongly with Georgians is that this winemaking tradition dates back 8,000 years. That’s a lot of harvests! That’s also the reason Georgia is called the “cradle of wine”, even if neighboring Armenia and Turkey dispute that title. Modern style wines are made there as well. I like tasting modern wines to see the purer side of local grape varieties. It’s a striking contrast that in modern winemaking we generally think of old, neutral vessels as giving a purer grape expression. With qvevri – whether new or old – both vessel and winemaking can radically change grape expression.